I cannot recommend this book highly enough. WOW! What a wealth of wisdom and practical advice that rings so true. I saw pretty much all of this in my own parents and upbringing so can totally verify his words to be right on. 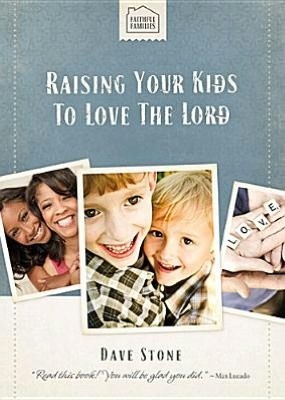 Our Children are more likely to love the Lord if we do. They can spot hypocrisy a mile off. Be genuine in your faith, be consistent. They will watch you. Do what you say you are going to do. Be clear about your priorities and the priorities of your home. To serve God and love God and put God first in everything. Successful parenting is when your children can follow God's leading. It's not whether they succeed in college or jobs and if you put that as the priority over their relationship with God, then they will pursue that instead of Him. Prayer is the most important thing we can do in life. Talk to God in front of them and in daily activities involve them in praising God and referring to Him in situations. Teach them by example to pray for people around you. Pray together before school and before bed. Read them stories from the Bible but as you do be aware that you don't want them to just know the story of Daniel for example. You want to raise up a Daniel...or an Esther etc. Teach them scripture at bedtime - display scripture around the home. Have memory verses. Read the Bible yourself so they see you. It shows it really is important. Be consistent in your expectations of them and in your discipline. Teach them to obey the first time, not the third or fifth. They need consequences if not obeying the first time. Train them this from toddlers. Have a close bond/consistent relationship with your children. Then they will be more willing to accept discipline. Where there is no relationship there is rebellion. Make your home a calm, safe place for them. Not busy rushing here and there to lots of activities all the time. A family in chaos creates instability and insecurity in children. Eat meals together. Affirm them. Offer them back to God. Pray for them. Teach them to focus on others by choosing one member of the family as the special one. Pray for that member and thank God for them and then name a fruit of the spirit that they have seen in them...all input into this. The Goal of motherhood is to be a woman of God. Then you can truly impart into your children from your supply. Dads need to love mom and treat her special, romance her and love her in front of the children. Children feel safe and loved when they see this. Keep arguments and disputes private. Teach respect. Children need to look into people's eyes when they speak to them. Serve others. Honor others. Make memories with each child. They'll remember them. Encourage them. Your childrens friendships will determine the direction of their faith... so surround them with quality christian role models and others demonstrating faith and love of God. Be available for your children, before your schedule. They are the most important before work and other things. Please note: Booksneeze sent me a copy of this book for review. This review is not influenced by anyone else, it is my own. This isn't the type of book I normally read - yet something about it intrigued me. I can't really comment on the look of the book as for some reason the publisher sent me an uncorrected proof which has a different cover and isn't quite put together right - which was disappointing... still at least I could read the content well. Having now received the final edition I will update the photos on this blog post to reflect the cover as it is now for sale as. It is a hardback book with a beautifully designed sleeve cover. FANTASTIC book! I enjoyed every minute of this one. I was so excited to read this as MercyMe is one of my favorite bands and I LOVE Bart Millard's voice. This book was so eye opening to the horrendous things he went through as a child and through his life. Had me in tears on so many occasions - just breaks my heart to see children treated so badly. This book takes you through his journey. I never knew MercyMe had been around so long! So great to hear the heart of the band and learn about their journey and commitments too. I whole heartedly recommend this book. Gives a new appreciation to the depth of MercyMe's lyrics, knowing the pain behind many of them. Also seeing how these guys are just sold out to Jesus. This book also mentions about the movie of Bart's life that's coming out - but in the movie they had to take out a lot so Bart wanted to fill in a lot of the gaps that the movie wasn't able to include. I have to admit, the first thing that drew me to this book was the cool cover design, then the fact that Louie Giglio writes it. Talking about giants falling definitely piqued my interest also. Louie launches the book in the story of David and Goliath, recreating the scene in a way I had not fully thought through before, as a masterful storyteller would. He goes on to talk about the giants we face in our life. How often we think that the lesson of the story is that we are David, facing our giants, whereas the reality is, that it is Jesus who has faced our giants victoriously, when He went to the cross. In Louie's words 'Your giant is dead, and yet your giant is still deadly' p33. He compares this to killing snakes and pulling off their heads and how the head is still dangerous if someone steps on it. Using this analogy he compares our giants to the snake heads that we stand on and get bitten.